Additional Info: High Chair, travel cot, Hair dryer. On booking we require a booking fee of £75.00 deposit then holiday to be paid for six weeks before with a returnable bond of £75.00. £75 secures your booking. Balance not due until 6 weeks prior to your holiday. 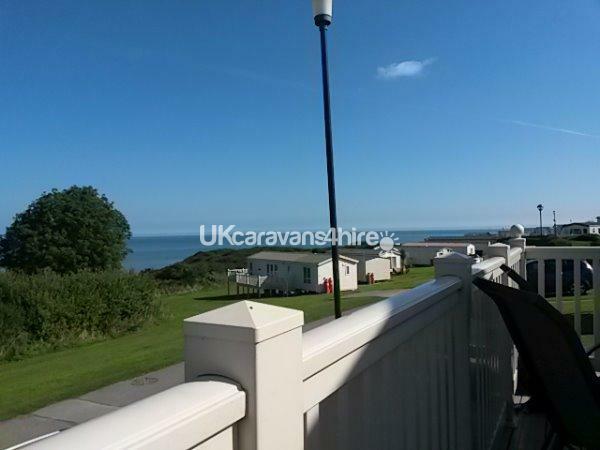 This 40ft x 13ft Platinum graded 3 bedroom, 6 berth static caravan is located on Silver Woods area of the Reighton Sands resort, ideally situated 2 Mins walk to Funworks & entrance to the beach. This Platinum Graded caravan with Double Glazing and Central heating has 3 bedrooms and can sleep up to 6 guests, with a rap round decking and also a patio area on the side. The lounge has 42” TV & DVD Player and selection of DVD’S. Game console and controller. Free standing sofa and chair, Eletric fire & with a coffee table. Fully fitted kitchen with 4 ringed gas hob, oven and separate grill, built in Fridge Freezer, Microwave, Toaster, Toastie Machine and Kettle and Tassimo coffee machine. All cooking utensils and crockery for guests and plenty of storage cupboards, Dining area as a free standing dining table and 4 chairs. With high chair if needed. Master bedroom has a double bed, wardrobes, Dressing table and TV with built in DVD player. Two twin rooms both have wardrobes and storage & 24" TV with built in DVD. Travel cot provided NO bedding is provided for travel cot. Freshly laundered bedding with beds made up for your arrival for a small charge. Small collection of books and games are provide for your use. Park Wifi is available within the caravan. Complimentary welcome pack containing first hot drinks are included free of charge for all bookings. Dogs welcome at a cost subject to a maximum of two small dogs or one large. Terms and conditions apply. Please note that Haven do not permit certain breeds on the site. Havens rules apply whilst walking dogs on site. TERMS AND CONDITIONS: £75 deposit per booking is required to secure your booking. Holiday cannot be held without a deposit payment. Payment in full is due 6 weeks prior to your holiday. Failure to pay in full by the given date may result in your booking being cancelled with no deposit refund. Once balance has been paid in full you will receive email confirmation, a copy of the caravan inventory and map showing the location of the caravan. An additional £75 refundable security deposit is payable on payment of the final balance. This is to cover any loss/damage which may occur to the caravan or its contents. This will be returned immediately by bank transfer following inspection of the caravan as long as it has been left in a clean and tidy condition and no loss/damage has occurred. Please allow 3 working days for this to show in your account once you have provided your bank details. Pets: Dogs permitted subject to a maximum of 2 small dogs or 1 large dog. Only well behaved and trained dogs are permitted. Dogs are not allowed in the bedrooms or on the furniture. Dogs must not be left in the caravan alone for long periods of time and must be in a cage if left alone in the caravan. Please note Haven do not permit certain breeds on site. Park passes are not included in the price. These are required for entry into the entertainment complex and swimming pool. These can be purchased direct from Haven upon arrival if required prices listed below. Reighton Sands is one of Havens 37 holiday parks, so goes out to impress offering something for everyone and great value for money. The park offers non-stop action boasting an indoor swimming pool and a Lazy river. Cooks Fish and Chips, and a family friendly Hawkwood alternately you can use the Mash & Barrel Pub. Reighton Sands caravan park, direct beach access to were you will find a beach café You can walk down the hill and easily access the train. There is an on-site SPAR convenience store with gift shop that sells a variety of everyday products. Hi Neil I am sorry to here that you was not happy with the caravan but when I spoke to you after you left you did not say anything to me when I ASKED if everything was ok for you and your mother and you told me the caravan was beautiful and clean and for saying our customer service was not good then I am sorry once again to here this but I answered all your question at the time of booking and If I remember correctly all you wanted was some where for you and your Mum to stay for the weekend and you did not want to know about the area or what was on the site. Beautiful luxurious caravan on a fantastic plot with amazing views from a lovely veranda. The caravan is toasty and warm with central heating - very welcome in Autumn when the wind is coming down the coast from the North. The kitchen has more worktop space than my own and it was a bonus that there was a domestic sized fridge/freezer. It is in a prime position near to all amenities yet lovely and quiet with hardly any cars passing by. The owner is friendly and always responds quickly to any queries one may have. I wouldn't hesitate to go back and am looking to book for next year. The best caravan I have ever stayed in by a country mile! Thanks Karen. lovely caravan with views of the sea didnt want the week to end. big thanks to owner karen for all her help. will hopefully be back. We have come to Reighton Sands for many years and this is the best caravan we have stopped in. It's in a nice quite spot, clean and has every thing you might need and more. We all had a great holiday, even more so with are pet labradoodle being able to come with us. Hope to be back again. Ratings speak for themselves! 10s all the way. Originally booked the caravan on here but the owner was using it for her own break away (can't blame her!) she came back with another caravan for me to use at short notice too as I only called her the day before. Clean lovely caravan, great view of the sea and on a great site with plenty to do for my young kids and my teenager. The owner Karen is a lovely women who is More then happy to help. We have already booked to return in 4 weeks time! Looking forward to our next family break, thank you! My first impression of the accommodation was WOW! Very tasteful in its decor and had the feel of a 'home from home' instantly. All appliances functioned perfectly and were clean and well maintained and you could tell that this was privately owned as care was taken over everything. The owner was very courteous on the phone and we communicated via text after our initial conversation , she never kept me waiting for a reply and she gave insight into to how to best make use of the facilities. The plot location was better than perfect , close to local amenities and transport routes both urban and rural but far enough away so as to be quiet and private. The view however , you cannot put a price on , ocean aspect and aside from bunnies frolicking in the grass at the front of the plot an expanse of oceanic beauty and tranquility which we all found very relaxing and therapeutic , I loved being able to hear the waves breaking whilst sitting on the decking and watching the boats glide by in the distance. In summary owner is a definite 10 , accommodation a certain 10 and the view 12! Perfect and I wish we could have stayed longer. A special thank you to the owner for a great break ( if only you could own the weather too! ). We will look forward to our next stay. Absolutely beautiful caravan, lovely spot and a very nice amenable owner to deal with. will definately be booking again.